New Services! Check out our new pages. We have updated all sections of the website with new photos and more ideas! Everything we make has an heirloom quality about it. We have several designs we have found to be popular enough to call Standard or Stock items, although they are made with the same care and craftsmanship as our Custom commissions. Some are ready to ship..... others require you to send measurements and are customer "fitted". 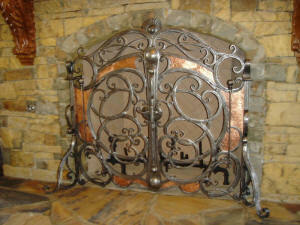 We also design and fabricate unique and "one of a kind" ornamental ironwork pieces on a commission basis. We are firmly committed to excellence in design and craftsmanship. Look through our site and get to know us....new pictures are everywhere! We are waiting to hear from you!